A powerful earthquake that rocked many parts of Balochistan and Sindh provinces of Pakistan on Monday, has left more than 348 people dead with more than 500 people injured.. 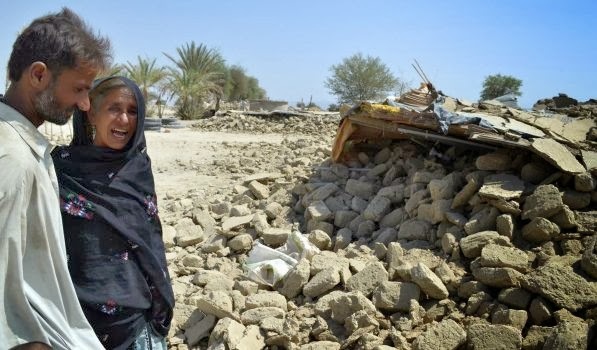 The earthquake measuring 7.8 on the Richter scale hit the generally inhabited areas of Balochistan where people live in mud houses, which obviously could not sustain the powerful jolt. The massive quake was centred in Awaran district, one of the poorest in Pakistan's most impoverished province, Balochistan. The area's medical infrastructure has struggled to care for the hundreds of injured who were crushed beneath mud brick houses when the quake struck. Pakistan Army and the Frontier Corps personnel are busy round the clock to provide shelters and remove dead and injured form the rubble of the collapsed houses.